Autocomplete is an ecommerce search suggestion solution that quickly suggests relevant recommendation to users as soon as they click in the search box. Its primary goal is to find out user intent and provide relevant keyword suggestions so users can easily navigate to the best possible Search Result Page. The secondary goal is finding out the product the users are searching for – which is more difficult to do in this scenario, because there are limited space in the autocomplete box to show products. In order for Autocomplete to be effective, it has to be fast. Prefixbox's Autocomplete works quicker than the blink of an eye. Our Autocomplete provides popular suggestions to users immediately when they click in the search box. As users begin typing, Autocomplete adjusts results instantly to provide relevant recommendations. Autocomplete is important, in fact it's the most widely used search feature and helps with conversion rate optimization. Prefixbox's Autocomplete recommends both keywords and products. When users visit websites on a desktop, 50% click keyword suggestions, 5% click product recommendations and 45% just hit enter. Users depend on keywords to guide them to high quality results on the Search Results Page, so it's important to display accurate results quickly in order to augment user experience on your website. Oftentimes, search boxes are implemented to show products only, instead of keywords, when customers start typing. However, simply displaying the product is not enough because the chance the right product is displayed is slim. Showing keywords is much more effective because it leads a potential customer to the Search Result Page with a wide range of UX options (filtering, sorting), which increases the chance of looking at multiple products, finding the right one and making a sale. 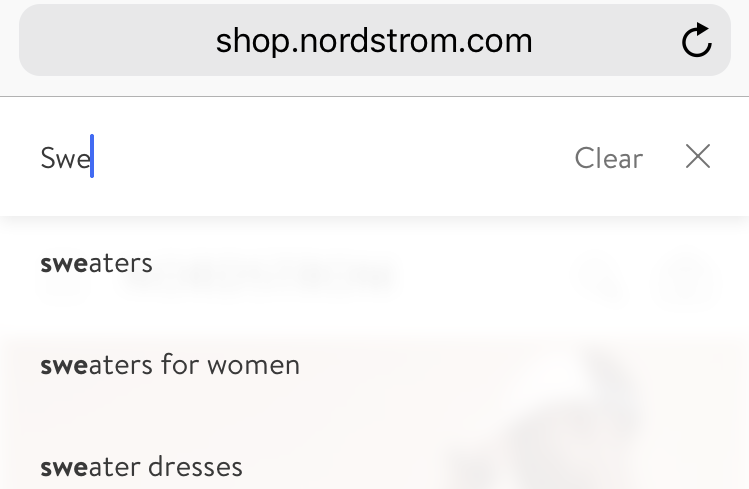 On mobile eCommerce websites – when the autocomplete box is optimized - 65% of search users select keywords. Usually, the search suggestions on mobile websites takes up half the screen while the keyboard takes up the rest, so it makes sense to show only keyword suggestions and no product suggestions in autocomplete in the mobile scenario. We usually set up different autocomplete search boxes for the mobile and desktop views. The additional benefit that the two scenarios then can be measured and optimized separately. We automatically update our search suggestions daily and suggest keyword terms the exact way users have searched for them in the past. Many search engines generate suggestions artificially based on product or category names, which is less effective and often times looks really weird (e.g. : inflection) as it doesn't directly mirror search user's language. Prefix matching is an efficient way to increase the accuracy of displayed autocomplete items. Prefix matching matches the first few letters of a search term to product titles. For example, if someone searches "bi" for "bicycle", prefix matching will suggest products (or keywords) with "bi" at the beginning of a word. Searches that are not optimized, will display results for any matches with the letters "bi" in the word, such as "mobile", which is obviously not helpful. In addition to prefix matching, Prefixbox is able to help with synonym suggestions. The software automatically mines and aggregates a list of applicable suggestions for each of your products and keywords. For example, for the term "bicycle", Prefixbox might create a synonym list that looks like: mountain bike, child's bike, city bicycle. The same applies for those who search "desk" and results named "table" appear. These synonym suggestions help the user discover many more products in your online store regardless of your product naming. Prefixbox highlights searched phrases in the suggested keywords and product title text, so users can quickly identify why certain products were recommended and find exactly what they're looking for. This gives additional usability benefits to users. Product suggestions are recommended by a ranking system that is updated daily, so the most relevant and popular suggestions are listed first. Prefixbox ranks products based on product page views, search engine result page (SERP) clicks, cart actions, and number of orders. Most solutions only rank products according to the number of times they've been ordered, but this can lead to an inaccurate ranking, since order events don't happen too often as the other events listed above. Especially for new SKUs relying on order event data is very sparse. Sometimes products are sorted alphabetically, but this is even worse. Customers should be able to find the most popular products easily. The way products are ranked is important. The first displayed item is most likely to be selected, so it should be an accurate match - one that leads customers to the product they want to buy. The following results that are displayed are exponentially less relevant. This trend can be observed in any recommendation engine (positional bias). Since the first result is most likely to be clicked, you need a proper ranking system. If users are shown too many products after every keystroke, they are likely to get information overload and discontinue looking for the product they initially came to find. This is also why keywords are more effective than product recommendations and showing more than 10 suggestions is not recommended. Prefixbox also allows you to display category suggestions, which isn't generally very effective since shop categories usually have different names than the terms people search, but you have this option with our Autocomplete if you would like to test it. The reason sometimes ecommerce product owners prefer category suggestions in autocomplete is because their category pages are more optimized for conversion and offer better UX. In the Prefixbox portal, you can easily edit the amount, order and type of suggestions you would like to be displayed on your search box. These changes can be made in the matter of minutes and go live in a few seconds based on the settings you provide on our self-service portal. We recommend displaying 10 or fewer product and keyword suggestions. For example, 4 products and 4 keywords or 6 products and 4 keywords etc. We offer separate autocomplete setup for desktop and mobile, so your eCommerce search is optimized for however your customers like to shop. Creating autocomplete boxes take a few minutes and is easy. If you have a mobile site in addition to your desktop site, we recommend setting up two separate search boxes, so that you can see the search data separately. We also recommend this if you have a responsive website (the same site with separate desktop and mobile views). Since mobile screens are smaller, we recommend only displaying keyword suggestions in order to save space.